Real efficiency in logistics automation is achieved when the entire workflow is handled by robotics solutions that communicate smoothly with each other. 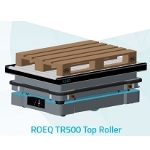 That's the vision behind ROEQ's new TR500 Top Roller unit that automates load and unload operations of the MiR500, the largest and most powerful autonomous mobile robot from Mobile Industrial Robots (MiR). 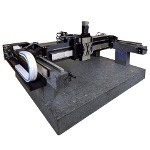 Danish company ROEQ is launching the Top Roller at the Automate 2019 show in Chicago this week, along with a host of other add-ons for MiR. The TR500 accommodates U.S. pallets and can be delivered with a fully automated lifter functionality for pick-up and delivery of goods. Self-lubricating ball bushing bearings have experienced an increase in use among motion system designers thanks to their ability to significantly reduce cost of ownership, improve performance, and deliver virtually maintenance-free operation. 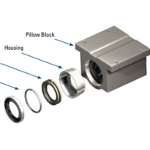 However, these bearings may not reach their full potential without being properly specified, installed, and evaluated for compatibility with their intended environment. Learn how to specify them for long-lasting use in your motion system applications. Read this informative Thomson article. The new V-417.336025E1 linear translation stage from PI is engineered for industrial applications with high demands on dynamics, precision, smooth scan motion, short settling times, and low tracking error. It provides 32 in. of travel (813 mm). The stage achieves high velocities to 79 in./sec (2 m/sec) based on a direct-drive ironless linear servo motor. High accuracy, repeatability, and functionality are guaranteed by an integrated absolute-measuring linear position encoder featuring 1-nm sensor resolution. Applications include: pick and place, optics, semiconductor test and inspection, bio-tech, DNA sequencing, 3D printing, and laser processing and machining. Miki Pulley's BXR-LE spring-applied Electro-Magnetic brake series safely holds a static position, without the need for external power. When the stator is energized, the brake is disengaged allowing free rotation. When no current is applied, compression springs halt the brake rotor, thereby stopping the input shaft rotation. This is an ideal feature to prevent rotation during power failure events. There are six total size configurations in the BXR-LE series to choose from. Of particular importance: These brakes have a slim design and high holding torque in a very compact package. Great for robotics. 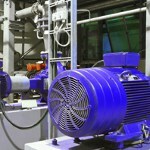 Using a variable frequency drive (VFD) can be beneficial in many constant speed applications driven by electric motors, such as those that require controlled starting and have been historically served by a reduced-voltage soft-starter (RVSS). While an RVSS and a VFD can both provide a controlled start, let's examine the benefits of each technology and when it makes sense to use one over the other. Read this informative Parker Hannifin blog. Advances in technology and software are expanding the scope of potential cobot work environments to include small and mid-size operations. That's why Rollon Corporation has created a Seventh Axis system for collaborative industrial robots from Universal Robots (UR). 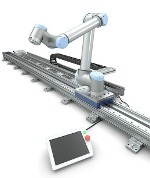 This shuttle system is designed to extend the operating area of UR's cobots to enhance their performance in automated processes for various industries without sacrificing their simplicity. The new EC-i 52XL 200W Brushless Servo Motor from maxon is a powerhouse. 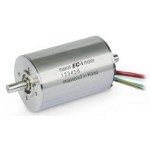 When space is limited but high torque and dynamics are required, the maxon EC-i 52XL motor is the ideal motor choice. 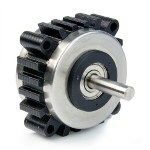 With its extended length (80 mm to 110 mm), this motor with flux collector rotor provides outstanding torque performance compared to the existing EC-i 52 180W High Torque that is often needed, especially on the industrial automation front. Its extra power can be even more significant at relatively low speed, which makes it a solid fit for a variety of industrial applications including material handling and transport systems. ABB has launched a full range of IEC Food Safe motors designed for applications in the food and beverage industry that need frequent sanitation. The new IEC Food Safe motors are part of ABB's Food Safe family that includes stainless steel NEMA motors, mounted ball bearings, and gearing. 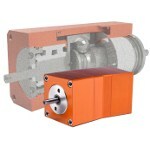 Motors are available in the power range 0.18 to 7.5 kW, in 2- to 6-pole versions for 230- to 690-V at 50 or 60 hertz. 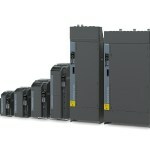 They feature IE3 premium efficiency to reduce energy consumption and emissions. Flexible mounting arrangements ensure they will fit almost any application. Frame sizes are 71 to 132. 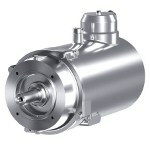 Siemens has introduced the new Sinamics G120X drive, a simple, seamless, and easy-to-use drive designed for use in pump, fan, and compressor applications in industries such as water/wastewater, HVAC/R, irrigation/agriculture, and in industrial environments. Sinamics G120X has a power range of 1 to 700 hp (0.75 to 630 kW) and can operate in temps from -4 to 140 F (-20 to 60 C) with any standard motor, including synchronous reluctance motors (SRM). It has an integral DC choke that improves harmonics and EMC performance. Sinamics G120X meets all the latest and upcoming UL, NEMA, and EN/IEC standards for 2019 and beyond and offers up to 100-kA short-circuit current rating (SCCR), ensuring enhanced product safety and energy efficiency. PI has added to its family of precision automation sub-systems with the A-351 MGS, a compact mechanical gantry system engineered to deliver maximum throughput for applications that require controlled precise overhead motion. The gantry is driven by linear motors, and each axis is equipped with preloaded linear bearings. Applications include high-precision 3D printers, assembly, pick-and-place, alignment, inspection, and other industrial automation applications. The A-351 MGS gantry system is designed for high load capacity of 20 kg, twice the amount of its A-341 air-bearing-based sibling. Absolute-measuring linear encoders with nanometer resolution are optional. 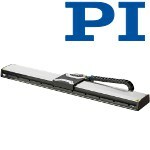 See PI automation platforms in action. Novotechnik's TF1 Series touchless linear position sensors overcome issues with legacy magnetostrictive technology. They are unaffected by strong magnetic fields and metal flakes or filings present in a user's environment. The TF1 Series consists of an inductively coupled position marker attached to a moving rod/piece of the user's application that requires a position measurement and the sensor with operational and programming status LEDs. While operating, LEDs indicate whether the sensor is operating and the marker within measuring range or out of range, as well as indicating results of internal diagnostics for valid output from the sensor. Can also measure speed and temperature. Recent developments in motion control and engineering make it possible to inspect and perform maintenance in compact sewers from the inside. 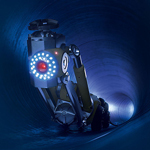 The underground sewer robot is equipped with a swiveling camera and an air-powered milling machine driven by FAULHABER miniature DC motors from MICROMO. 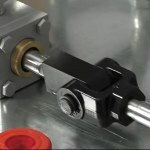 Machine designers are converting existing linear motion systems from hydraulic to electric due to the technology's many benefits, but the process involves considering the actual force output of the cylinder, the duty cycle, and the motion profile. Specialists at Tolomatic tackle these points. Includes a very informative video. The slim-design G3718V whisper torque motor from Lin Engineering incorporates a heat-sink design within the stator laminations to allow for passive cooling. When your motor operates cooler, you can increase power to gain more torque without overheating, or you can save energy and still perform at optimal performance. At only 22.8 mm long, this motor produces 25 oz-in. of torque. 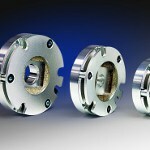 Rolling Motion Industries (RMI) has released two new traction drive speed reducers. With only six moving parts, they typically outlast conventional gearboxes and speed reducers by a factor of three. The MAR17-1-3.1 Speed Reducer is designed for input speeds up to 3,600 rpm with 10 to 20 in.-lb of torque, and the MAR-23-1-3.1 Speed Reducer is rated for the same speeds but with an input of 20 to 30 in.-lb of torque. As the output speed is reduced by a factor of three, the output torque increases by a factor of three. These high-efficiency speed reducers generate up to 72 percent less heat because they use a special engineered fluid that cools and lubricates the traction drive. The unmanned refueling aircraft is completing engine runs and testing. We'll make it short and sweet because, well, we have to. Boeing isn't putting out a lot of details for its new unmanned aircraft system (UAS) best suited for refueling U.S. Navy jets operating from aircraft carriers. The company released a photo Dec. 19 of the super-stealth-looking, working prototype for the Navy's MQ-25 competition. The Navy is seeking unmanned refueling capabilities that would extend the combat range of deployed Boeing F/A-18 Super Hornet, Boeing EA-18G Growler, and Lockheed Martin F-35C fighters. The MQ-25 will also have to seamlessly integrate with a carrier's catapult and launch and recovery systems. The UAS is completing engine runs before heading to the flight ramp for deck handling demonstrations early next year. The company's famed Phantom Works division is working on the aircraft. Don "BD" Gaddis, a retired admiral, is leading the refueling system program. Gaddis says, "We will be ready for flight testing when the engineering and manufacturing development contract is awarded." The Navy issued its final request for proposals in October. Proposals are due Jan. 3. It was widely reported at the end of October in industry news, including Jane's 360, that top-contender Northrop Grumman had withdrawn from the competition. The MQ-25 system will deliver a robust organic refueling capability to make better use of our combat strike fighters and extend the range of our aircraft carriers. The system will be a critical part of the future Carrier Air Wing (CVW) and will enhance carrier capability and versatility for the Joint Forces Commander through the integration of a persistent, sea-based, multi-mission aerial refueling Unmanned Aircraft System (UAS) into the CVW. MQ-25 will be the first air system procured by the Navy's Unmanned Carrier Aviation Program Office. It is comprised of three major architectural segments: an Air Segment (AS), a Control System & Connectivity (CS&C) Segment, and a Carrier (CVN) Segment. 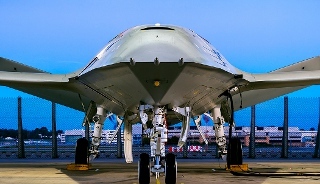 AS -- Includes the MQ-25 UAS, which is composed of the MQ-25A Stingray air vehicle and associated support and handling equipment including the deck handling system, spares, and repair materials. CS&C -- Includes the Unmanned Carrier Aviation (UCA) Mission Control System (UMCS) and its associated communication equipment; the Distributed Common Ground Station-Navy (DCGS-N) mission support functionality; all network-based interfaces and routing equipment required to control the Stingray; and all required modifications to existing networks and C4I system infrastructure to enable tasking, collection, processing, exploitation, and dissemination (TCPED) of the Stingray's ISR information. CVN -- Composed of CVN ships' spaces allocated to UCA as well as installed ship systems and modifications necessary for interface with the Air and CS&C segments. CVN systems important to the MQ-25 include aircraft launch and recovery systems, data dissemination systems (including radio terminals and antennas), and deck operations systems. These segments are overseen by the Government Lead Systems Integrator (LSI), providing government-led system-of-systems integration for the Unmanned Carrier Aviation Program. MQ-25 will leverage existing Line of Sight (LOS) and Beyond Line of Sight (BLOS) communications links and interface with existing ship and land-based command and control systems, including ISR TCPED systems. It will significantly increase the range of manned CVW aircraft with its enhanced refueling capabilities, pioneer the integration of manned and unmanned systems within the CVW, and pave the way for more multifaceted multi-mission UAS' to pace emerging threats. Copyright © 2017 by Nelson Publishing, Inc. All rights reserved. Reproduction Prohibited.